Published by Martin Giger on September 29, 2013 in News. Closed Tags: social media. As you’ve probably noticed, I’ve been hyperactive on Nightingale’s Twitter and Facebook. I’ve tried to post as much news and interesting stuff to you as possible. Basically, everything that’s not worth to blog about but still is of value for you. The goal is to keep you informed on what’s going on. It also helps in showing you that Nightingale is alive and evolving. That’s also why I’m posting these insights here. I want to share a few of my insights I got from the last month with you. Bare in mind, that this doesn’t apply to our Google+ presence, I didn’t have the rights to post there just until recently. What’s the most important thing in Social Media? Interaction. So, which network does give us the most interaction? Both. You get a lot more direct feedback on twitter, while on Facebook you know how many have seen it, and some will like or even share it. It’s interesting that there is some sort of an active core fan base, who interact a lot more with our posts than the others. Some of you just fav every tweet we put out, while others (or are they the same people?) like each and every post of ours. Pictures interestingly do generally better on Facebook. They get reposted a lot more and liked far quicker. I asked myself, why would you immediately interact with a picture while you hesitate to interact with text or a link? And it’s pretty simple: pictures stand out of your feed. 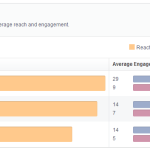 And if you look at other pages, they are constantly posting pictures, because you get that quick and big feedback. To analyze your guys feedback and our Social Media performance, I use a self-hosted ThinkUp instance and the Facebook analytics, which are pretty nice. What do I have planned? I want more interaction. Not because it’s cool, but I want the normal user to be able to influence the development. Because what the developers decide might be stupid for others. Big changes are usually discussed on github in the issues system. Would you notice that? Probably not. We only sparingly know what you guys really want. We do have a wished features list, but we don’t know what you want the most. At the moment we are being pretty selfish and are bringing Nigthingale “à jour”, so we keep up with technology. Also bare in mind, we are a very distributed development team; I am not the only one to post in our Social Media channels and I also develop parts for Nightingale. If you ever write about Nightingale, don’t forget to let us know! Mention us on Twitter, post it on our Facebook Timeline or share it with us on Google+. Even tough we try to catch all coverage about Nightingale, we might miss some, don’t let that happen! If you don’t follow us yet on any of these networks, go ahead and do so and stay up to date with the project. What do you think of our social media presence? What could we improve?